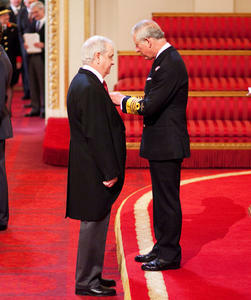 In recognition of his work as an international sea-level scientist, Professor Phillip Woodworth of the National Oceanography Centre (NOC) has recently visited Buckingham Palace to receive an MBE. Over the last twenty years Professor Woodworth has led a team of NOC scientists working on predicting global and regional sea-level change. From 1987 to 2007 he was the Director of the Permanent Service for Mean Sea Level, the global data bank for sea-level change. During this time he worked with the Department for Environment Food and Rural affairs (Defra) and the Environment Agency providing tidal analyses for UK coastal waters, some of which are used to open and close the Thames Barrier. During his two-decade chairmanship of the Global Sea Level Observing System, Professor Woodworth successfully secured funding to support tide gauges in the South Atlantic and British Antarctic Territory and UK. He championed the cause of tide gauges around Africa and in the Indian Ocean, where sea-level data are relatively sparse. These gauges also contribute to the regional tsunami warning system. Professor Woodworth is President of the International Association for the Physical Sciences of the Oceans Commission on Mean Sea Level and Tides. He is also Secretary of the Federation of Astronomical and Geophysical Data Analysis Services. He was a contributing author to the sea-level chapter in the First and Fourth Intergovernmental Panel on Climate Change (IPCC) reports and lead author on this chapter in the Second and Third reports. Our understanding of the drivers of sea-level change, and our ability to predict it, owes a great deal to Phillip Woodworth and the scientists working with him. His invited contributions to the high-profile IPCC and other ‘environmental state of the planet’ reports acknowledge this. Professor Woodworth’s contribution to sea-level science is outstanding and is recognised internationally through the award of the 2010 Vening Meinesz Medal of the European Geosciences Union, and now the granting of an MBE.